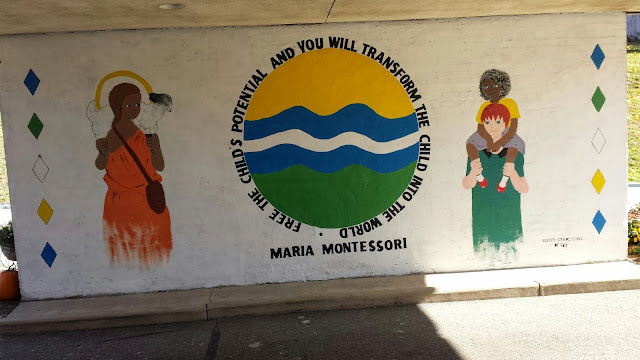 The Climate Chronicles: Good Shepherd Montessori School in South Bend: Exemplary! 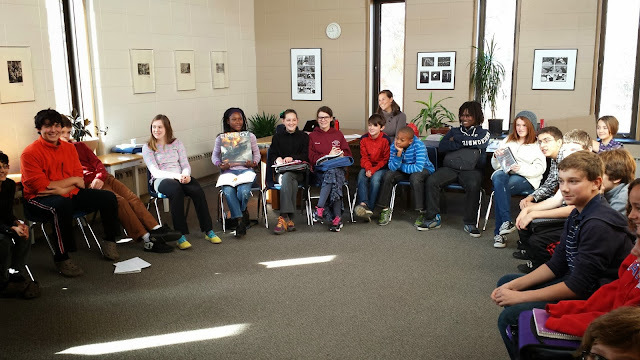 Pictured here is a portion of the middle school class I met with as part of my journey to my home town, South Bend, talking about climate change and what can be done about it. Having taught in the 90s at a K-8 Montessori school here in Indianapolis — Children's House — I felt right at home at Good Shepherd. In fact, I pretty much wanted to move in and live there -- as a student, a teacher or a custodian. Whatever they need. The students were unfailingly polite and brilliant and fun; they were attentive during my presentation and when I finished, they went around the room and talked about their upcoming projects — projects that embrace all sorts of sustainability initiatives. It was impressive. These students are engaged in issues surrounding walkable communities, with interests in increasing bicycle access throughout the city. They are working on a green roof, on composting, on salvaging discarded soaps. In short, they know as much about sustainability as most people twice, three times their age. This is the future, folks, middle school aged students figuring out solutions around resiliency, mitigation and adaption, while too many of our leaders won't even address the reality of how humans are altering the physics of our atmosphere with carbon pollution. Sorry to get on a soapbox but one of these kids will make sure my box will be made of repurposed soap. To paraphrase a great line in Casablanca, I trust this is the beginning of a beautiful friendship.